Whether you are using treats for training and behaviour rewards or as a bedtime snack, finding the right treats for your furry pooch can be a daunting task. There are so many types of commercial dog treats available on the market today that a trip to your local pet food store can easily make your head spin. Packaging has become brighter and more alluring. Labels are written with large and very attractive fonts claiming health benefits that can make you wonder if you shouldn’t be eating some yourself. So how do you pick the healthy dog treat? Look for ingredients that are fresh, pure, and as minimally processed as possible such as these from Thrive. Every ingredient on the label should be easily recognizable and a named sources. For example, animal fat begs the question, which animal? Poultry fat is more specific but is this chicken, turkey or another bird? Low-quality grain by-products should also be avoided; if the label does not simply say the name of a grain or grain flour, it’s a by-product. Stay away from treats loaded with sugar and fat. Treats should be easy on your dog’s teeth to avoid broken teeth. Avoid anything that you can’t push your thumbnail into and leave a mark. Treats should contain no artificial colors, flavour’s or preservatives. We’ve all heard about the ongoing warnings regarding jerky treats made in China – although that may not be the only problem. You can read about it here. While the FDA will not come right out and tell dog owners not to feed their dogs ingredients from China, personally I would err on the side of caution until a cause or explanation can be found. Treats contain calories and calories count. Obesity is one of the fastest growing health problems for dogs in the UK. 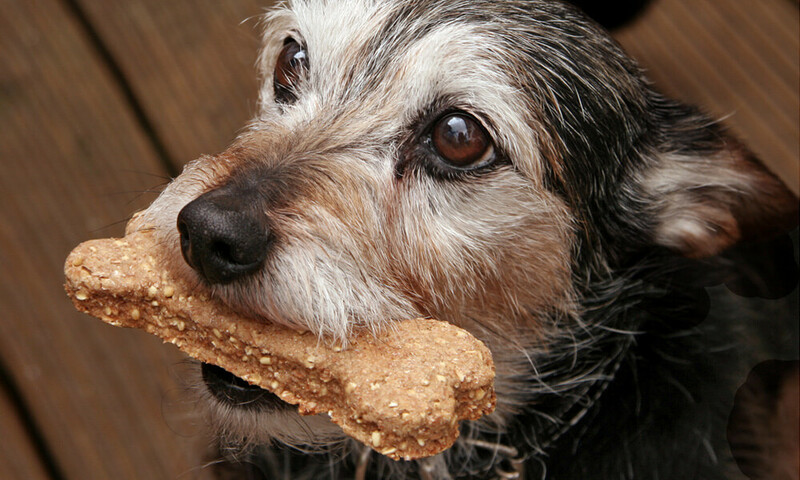 Treats should not exceed 10% of your dogs daily calory intake. You can skip commercial treats and try offering vegetables such as baby carrot, green beans, zucchini or fruits such as banana, pear, watermelon and apple slices (with no seeds). These have nearly no calories and are usually low in protein, fat, sodium and phosphorus. It’s very easy to make you own dog treats. Here are a few simple recipes. Slice boneless chicken breast, meat or fish into very thin strips. Place the strips on parchment paper and bake them for at least three hours at 80 degrees Celsius. The low temperature dries the meat slowly and the strips end up nice and crisp. Yogurt & peanut butter treats. Combine 200 grams goat or sheep yogurt and a few teaspoons of peanut butter with enough whole wheat flour to create a stiff dough. Roll dough to 5mm thickness and cut into shape. Place cookies on parchment paper and bake approx 12-15 minutes at 170 degrees Celsius. Mix 1-2 jars of dog-safe baby food (no onions or other ingredient that aren’t safe for dogs) with enough whole wheat flour to create a stiff dough. Roll dough to 5mm thickness and cut into shape. Place cookies on parchment paper and bake approx 12-15 minutes at 170 degrees Celsius. Other low-calorie treats that can work well are plain popcorn, miniature marshmellows and plain rice cakes broken into little pieces. More recipes can be found on our Facebook and YouTube channel. If you want to know how to choose the best dog food, this guide will explain the latest facts and findings on a variety of ingredients, pet food marketing as well as debunking some popular myths. This entry was posted in Blog, Treat Recipes. Bookmark the permalink.